Super Sonic Drops the Ball. Could have been a contender. Making the first USA SuperSonic item. But they couldn't be bothered to make it GOOD . As suspected no one did ANY RESEARCH to see that Super Sonic is actually different than regular Sonic. Yes his eyes are RED and not green (they're green here...yeah way to pay attention) and his spikes are different. 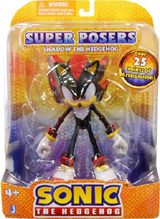 Because the Super Posers Super Shadow figure IS just a 'repaint' of the original figure, it doesn't get a pose file & etc. For that see: Super Posers Page. As you can see here, he does have some variances. They used white paint in his mouth (difficult to see in photo to right) instead of black, which is a little strange. His plastic IS yellow, so it's not like he's painted yellow. 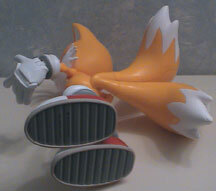 All articulation is the same, the stiffness of the joints will vary by figure like it always has. The one seen here has a small round dent in the forehead...but not all of them do. Inspect him! He is NOT glossy or platinum-colored. He is a rather cream-yellow. The other difference, is his shoes. Look at the backs of the shoes of each figure. 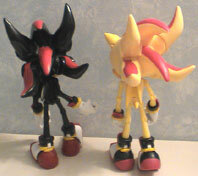 Super Shadow's are black with red, but regular Shadow has red only. Super Shadow is the accurate one. 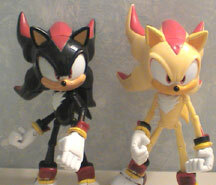 (as only the sole-area should be red) SShadow has the 'better eye paint' like the most recent Jazwares release regular-super-posers do. He does not seem to have any overspray/paint errors. What you can't see: The interior of the bubble has 2 parts to hold him in, which is an improvement. You wont see as many squashed ones or damaged noses due to more protection in the package. 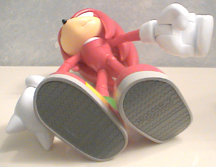 The back of the package has Sonic Tails & Knuckles on it for some reason, and no description. Over all: With Jazwares improved eyes, better paint, and better box combined with the pose-ability of the super poser, this is a decent figure. If you want a Super Shadow, here's your chance. A solid and decent figure, with no real glaring flaws. The color is the only thing up for debate as it's sort of shimmery/metallic in the game and not well defined. 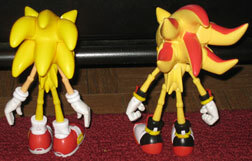 With these comparison shots, you can see that the Super Shadow really is a cream-tone yellow while Super Sonic is a bolder yellow. 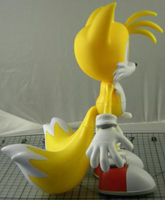 Super Sonic is the right COLOR but that's really where it ends. 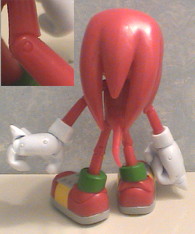 He has red eyes (as it should be) but his most important feature, the up-turned spikes have been ignored because really all this figure is, is a re-paint of a regular poser meant to extort money from the fans. 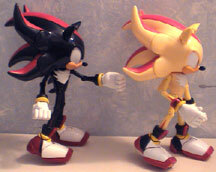 There was nothing to correct/improve (ie, Shadow's shoe was fixed) so their "Super Sonic" is really a bummer. 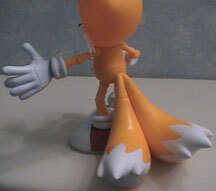 With all the great things Jazwares has produced , it makes this "cop-out" figure really stand out for what it is: a repaint/rehash that is NOT Super Sonic. 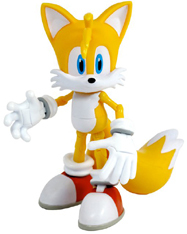 Get him if you absolutely need a yellow Sonic, but otherwise there's no real difference/reason to go for him. He may end up rare later just because they 'gave it a try'. 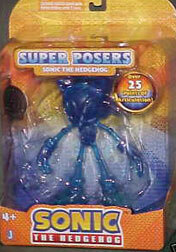 Once again, Jazwares has re-packaged the Super posers for another round of sales. This new box is far more compact with a square bubble instead of the roughly triangular dome. It uses the box front to house the Sonic logo (instead of it taking up a huge space at the top of the box) and have added more hexagon texture to the backgrounds. Also, they're now labeled with a cardboard inbetween-insert "Super Posers" and their name (which is FANTASTIC as they were too easy to confuse in poor photos with the 5in line so stores were getting up to shenannagins with them) You can now not mistake these guys for anything else. The dark dot on one side is the silvertone reflective "R" sticker for Toys R Us. 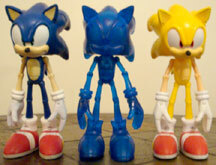 Also, as you can see, they re-released Sonic in the clear/blue plastic from the 3in line. With this close up, you can tell that the hinges, screws and even numbers can be seen on this figure. He wasn't meant to be transparent, so you still get the part numbers showing through. 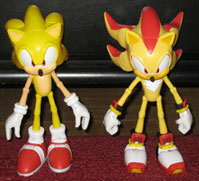 With this comparison shot, you can tell it's identical to the other Jazwares Super Poser Sonics, it's just made from transparent plastic exactly like that of the 3.75 inch comic-pak-Sonic. Darker blue swirls may be seen inside him where the plastic is thicker. The various posts that reinforce the design, as well as the hinges can be seen as dots. His facial features are difficult to see, but since they were a part of the mould, they're still there. His head has limited move-ability due to the spikes, but ALL of him always have this. Again, the waist swivel works very well here because he lacks a 'belly color dot' to disrupt. The bottom of his shoes are textured like they are in the game, which adds a nice touch. His plastic is actually red, so overspray/etc shouldn't be an issue. This figure is pretty much perfectly painted, you should expect the same. He's made of hard & semi-hard plastic (hard only appearing for his fists and feet) and he feels quality, good and solid when you lift him. This is a heavy figure! WHY did they do this? 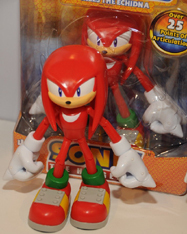 All 'Sonic' characters have enormous heads with ZERO articulation needed on the head. What's the need to make it solid so that the figure is extremely easy to tip over? There's no need for an incredibly tough/durable head when it has no need to articulate or carry tiny parts to snap off. Solid feet would at least help him stay vertical. 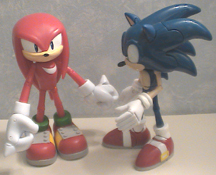 This is a huge problem with his heavy fists (the very hard plastic, even though they're hollow) and his heavy head. Notice the inset in the 'back' photo above. The elbow is actually WORSE than the ToyIsland version, in that he can't even hold his arm at 90 degrees. The front sticks downward/out and prevents normal movement. 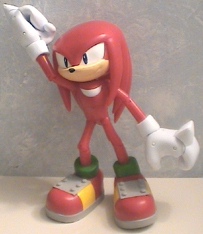 This, coupled with his heavy fists makes the arms wilt and flop rather than being able to pose. Why are the ankles and the wrists fatter? If the toy needed that for durability, why not just size up the whole limb? It would look more natural, and no one would complain. BUY this figure! 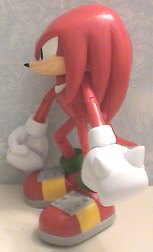 It is very Knuckles-like, the face is excellent, the fists are great, he's very pose-able/play-able. Once again, they've got the sculpt VERY well. His gripping action only adds to the fun! Also, he feels much more solidly built than the Toy Island ones, which were known for falling apart a bit. He lacks the annoying knobby-ness of the joints too, he looks smooth and cool. The price ($13.99, at most stores, including but not limited to Toys R Us in the USA) is also reasonable for this large of a figure with the level of articulation. 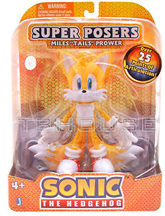 With this great new addition, everyone will likely be looking foreward to more Jazwares Posers. The legs for him seem a little thicker than normal super posers, and it looks nice with his arms, which are noticibly thinner than his legs. (proportional!) The wider legs help him to hold poses. Paint flaws have been reported on him, but not too frequently. Just look him over before you buy, and you should be all-right. He can't reach his arm directly foreword because the white spiked edge of his belly-dot 'fur' sticks out too far and prevents it. 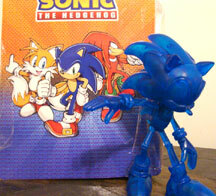 He displays well in their typical SP box, and feels sturdier than the old ToyIsland Sonic SP sculpts. His expression is cute/normal & his head is hollow/light (reducing tip-over issues) Since he's mostly orange plastic, it doesn't give a lot of opportunity for paint flaws. Defenitely add this figure to your collection if you can! Place 1 drop of super glue onto/into the joint that needs tightened. Then, rotate/move the joint in every possible direction that it can move for about 2 minutes, while the glue dries. The joint will be much tougher to move now. But, it has to be done for every loose joint you find. Essentially, what happens is the glue coats the inside of the joint but can't freeze it because of all the wiggling. It instead becomes like an extra layer of plastic to rub against the joint and tighten it. Instructions shouldn't be attempted if you are clumsy or something because it involves stabbing things with a screwdriver. 1. Using a thin small screwdriver, fit the head beneath the edge of one spike. The goal is to lift/bend the outer edge enough to slip the movable part off over the peg. You must use great force to accomplish this in 1 try, multiple tries will strip the screws. 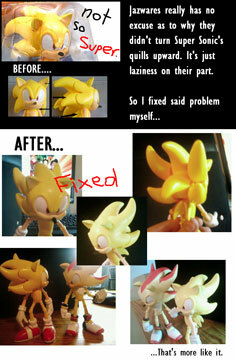 This multi-photo sequence shows the result of fixing your super poser (not super) Sonic. By prying off his spikes and re snapping them on, he can look slightly more super than he did right out of the package. NOTE: It IS POSSIBLE to break the figure by doing this so if you set out to modify, always keep that in mind! Be careful, and be prepared to buy a spare.